Spring is in the air and it is time to put some love and care into your lawn. Having a thick and healthy lawn helps improve a homes curb appeal but there are also environmental benefits when you take care of your grass. Your lawn releases oxygen and captures dirt and dust which helps to keep you and your family healthy! 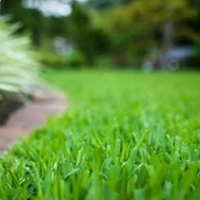 Here are a few natural lawn care tips below to help you achieve the perfect lawn. This is a natural process of punching small holes into your lawn to loosen the ground which allows water, air and nutrients to easily penetrate the grass roots. This technique of mowing the grass in different directions prevent wear patterns and encourages upright growth. You need to avoid mowing your lawn when it’s wet and remember to sharpen the blade several times during the spring and summer seasons. Do not ever think that cutting your lawn too short will help cut down the mowing times. This is the wrong approach. Believe it or not the tall grass is more stress tolerant, shades out weeds and has deeper roots to increase the intake of nutrients and water. It is a good idea to leave your grass clippings on the lawn as it provides essential nutrients; unless your grass is in really bad shape. Getting your home ready just in time for the Spring Market?